“Having attended a number of forums and talks by various bodies over the past two years where a Brexit update has been merely summarised as a ‘who knows’ shrug of the shoulders, I was really looking forward to a day of debate and the opportunity to gather some useful information. We had key updates from the Medicines and Healthcare products Regulatory Agency (MHRA), the NIHR Clinical Research Networks (CRN) and the NIHR Office for Clinical Research Infrastructure (NOCRI), as well as an interesting session on ‘Perspectives from UK CROs: Early Phase, Full Service SME and a Global CRO’. We still find ourselves in a precarious deal or no deal situation and yet I was impressed with the level of contingency planning that has been undertaken by individual companies to ensure that they can successfully continue to conduct their business. Despite this planning, there was still concern around the main issues such as QP release and supply chain delays for not only Investigational Medicinal Products (IMPs), but also around the supply of placebos, unlicensed products in and out of the UK and also the transfer of samples to and from centralised labs. The representative from the Department of Health and Social Care reported that they are fully aware of the issues and also have contingency plans to ensure that UK trial participants and NHS patients would be protected. CROs and Sponsors were encouraged to contact the MHRA and DHSC if they had any specific concerns; I have a feeling that their inboxes would have seen an increase in activity this morning. There were also questions posed around the future of staffing, given that a large number of EU nationals currently work within Life Sciences in the UK. The general view was that the existing shortage of good CRAs, due to an insistence by pharma on 5 years’ relevant experience, will only be exacerbated by EU workers moving back away from the UK and that solutions to staffing these roles would need to be more creative and flexible. Although I was pleased to hear the larger CROs talking positively about attracting young people into Life Sciences through graduate and apprenticeship schemes, although frustratingly (but not a complete surprise to me) only a couple could admit to attending science fairs to promote their placement offerings. In my view, UK based Pharma companies and CROs need to participate more in attracting our talented young people to the wide variety of career paths open to them in Life Sciences, as well as investing in their ongoing development or the skills gap is just going to widen. At CP we’ve been investing in our future talent (my main passion!) 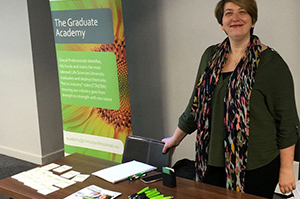 for some time already through our graduate Training Academy and more recently the apprenticeships in regulatory affairs and clinical trials, and can say hand-on-heart we’ve seen an immensely positive impact on the clients these graduates have been placed into. We just need far more uptake and investment by pharma and CROs to really protect our future economic endeavours by taking on and developing skilled labour ‘in-house’. The key message that I came away with was that the MHRA, NIHR and NOCRI were keen to promote the positives for companies to continue conducting research in the UK. They emphasised our expertise in many areas of research including early phase experimental medicine, proof of concept and our work on rare diseases which, coupled with our efficient regulatory framework and access to a large cohort of patients and healthy volunteers, still ensures that we are a global hub for research.